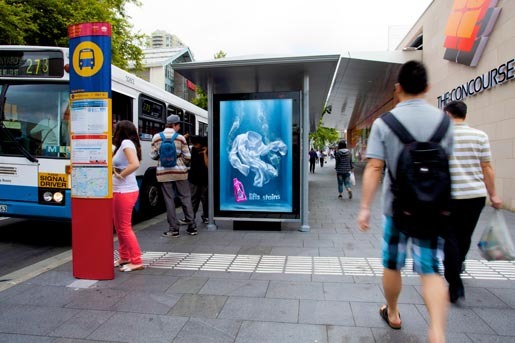 Vanish laundry liquid is being promoted in an outdoor campaign in which bus shelter ads appear to have real tanks built into them. A white shirt seems to be drifting in the water, with a cup, wine glass and ice cream floating above. 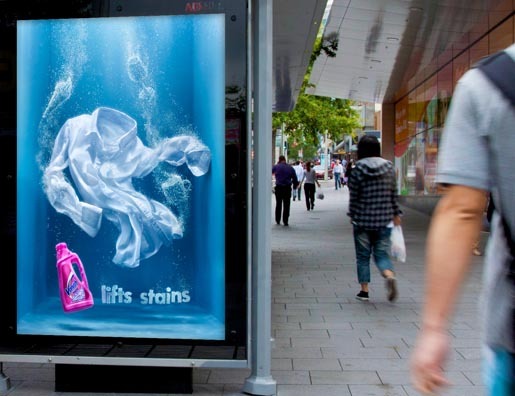 “Vanish lifts stains”. The Vanish Lifts Stains outdoor campaign was developed at Euro RSCG, Sydney, by executive creative director Steve Coll, creative Ben Pearce, producer Warrick Nicholson, group account director Manuella Perche, account manager Josh Sandford, working with Reckitt Benckiser marketing team Jennifer Osborne and Ashish Sethi. Retouching was done at Electric Art. Photographer was Stephen Stewart.